A long time ago the Pharaoh Anopheles was cursed. Since then his mummy has restlessly roamed the dark corridors of the pyramid, scaring away anyone who dares intrude. He has obstructed the path to the burial chamber with traps and boulders. Only the bravest adventurers can successfully remove the boulders from the mummy trap without making the staff fall over or forcing other boulders to fall out. 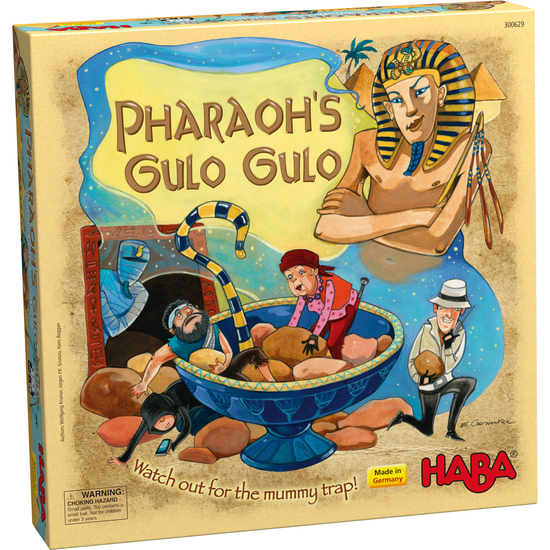 Who will be the first to reach the Pharaoh's sarcophagus and free the mummy of the curse? Contents: 1 game board, 1 mummy trap (bowl with 20 boulders and 1 Pharaoh‘s staff), 6 adventurers, 1 mummy, 24 scarabs, 8 burial chamber markers, 16 pyramid markers, 8 desert markers, 1 debris bag, 1 set of instructions.